It's a quiet evening and so different from many Halloweens of years past. It used to be all about costumes and parties with scary finger-foods. But now it's more of a reflective holiday for me.... it's about remembering those who have impacted my life and have since passed on. They say that this time of year is a time when whatever boundaries dividing this life from the next are at their thinest. Spirits are abound and messages can be shared. So this is my message to those who I've loved and lost... thank you for being in my life and for making it all the more rich by knowing you. I miss you and love you. Happy Halloween, everyone! Have fun and take a moment to honor the memories of those people who have left this world, but are not forgotten. I find myself compulsively making these premium mixes while I'm at the store. 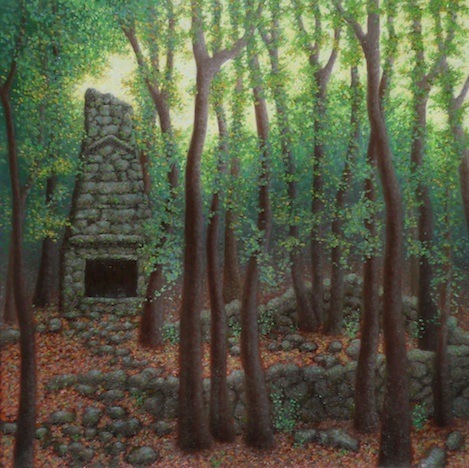 It's extremely relaxing to summon an image to mind and then try and create a blend reflective of that mental picture. Scissors in-hand, I walk around clipping strands and filling my bowl. The best results come when I have a personal connection to the reference and hold it in my mind while gathering... sometimes whispering the name repeatedly. It may sound bizarre, but I think it's helpful. The concept of a "deeper well" is one that I come back to time after time. An artist can lead a solitary life in the studio, diving into a personal headspace that can only be translated with the work produced. The "Deeper Well" is sort of a manifestation of that place we go, deep inside. I see it as a place that's cool and dark... perfect for seeing sparks of imagination. I actually wrote about it in my second blog post back in July of 2006. CLICK HERE to read that blog post. In creating a mix that represents this highly abstract concept, I turned to a blend of deep blues, cool grays, luminous blacks, and sparkling silvers. CLICK HERE to read more about the "Deeper Well Mix". When I started to learn more about plants and mushrooms (particularly edible ones), something happened. It was an odd sense of independence that came with a closeness to the secret knowledge of nature. Suddenly I was "free" from society and could live off the grid and amongst the wild. Nature was generous and provided ample things to fill one's stomach with, but nature does more than just feed the body – it feeds the soul. Thusly the idea of this mix came about... the "Good Earth Mix". It's a combination of golden yellows, young greens and old browns. CLICK HERE to learn more about this particular mix. In creating these mixes, I went from as far as one can go within to as far as one can go outwardly. 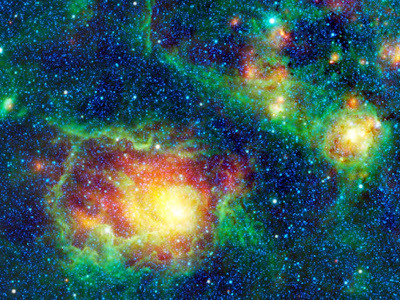 I thought about the frontier of space and how the telescope pictures reveal an amorphous rainbow of inspiration. The "Nebula Mix" attempts to bottle and harness that otherworldly beauty of the stellar photographs with a blend of oranges and greens with a subtle sprinkling of blues. This mix is vibrant and playful. CLICK HERE to find out more about this particular blend. The last blend I worked on is called the "Regina Mix". The word "Regina" means "Queen" and I wanted to make something as richly decadeent as befitting a queen. This mix is composed of a blend of scarlet reds, fiery oranges, and sparkling golds. CLICK HERE to read more about this regal mix. When it starts looking like this outside (see the snow? ), I fire up the crock pot. We're fortunate enough to have electricity and while at the grocery store, I went with my instincts (and thrifty nature) to go for the deeply discounted meat department as opposed to the emergency rations aisle. Luckily the power stayed on and I didn't have to break out the grill in the middle of a hurricane with snow. With the beef, I slow-cooked it overnight in a sweet and tangy tomato sauce. (Think of the sauce as a hybrid between marina and barbecue sauce.) The extended cook-time over a low heat in combination with the acidity of the tomatoes and the apple cider vinegar, helped keep the meat extremely tender and succulent. When the sauce is as good as this, I firmly believe in a "flavor-soaker-upper". My go-to side-dish is rice. With an Asian mother, every meal was served with rice. But I wasn't feeling the rice, bread or pasta. Instead, I made spiced sweet potato fries! Before baking them, I tossed them in olive oil and dusted them with a combination of brown sugar, corn starch, ground pink peppercorns, cumin, cayenne pepper, cinnamon, and salt. Eaten as a snack alone, a squeeze of lime over these tasty morsels sends them out of this world! The blend of flavors of the sweet potato fries and the slow-cooked beef was simply delicious and did well to keep the snowy cold at bay. All things considered, we're doing pretty well. We sustained minimal damage and are very fortunate that nothing major transpired here. I look at pictures from New York City and my heart goes out to them. I used to live there and know that despite the tough exterior and bravado, the City can be a fragile place. Although we've been blessed, not everyone in the area has been so lucky. The recent drought conditions combined with all the heavy rains has caused some heavy flooding. Gentle creeks have swollen ten times their normal size and rush rapidly. A few of the local bridges have been closed, because they're submerged. While I was driving along the detour, snapping pictures when it was both safe and convenient to stop, I thought about the hellbenders. I've mentioned them before on the blog and how the creeks in the area are home to the rare giant salamander. It's one of the few places in the world where they are breeding in the wild. The water has to be pristine and be slow-moving. So along with everyone else... hang on, hellbenders! I've been using a lot of vintage components in creating my new Premium Mixes and have received a few curious emails asking how I know that they're actually "vintage". Firstly, there's a lot of debate on what qualifies as "vintage". Some say that it's seven years or older, but not over 100 years. Then it becomes an antique. Some say that it's 15 years or older, but generally most people agree that it's 20 years old or older. I have even heard a definition that related not so much with the age of a material, but with the ownership. For the purposes of this post, I'll go with the definition that it's 20 years old or older. 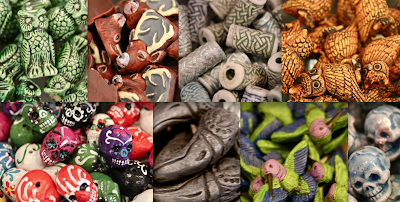 I also must preface this post by saying that I'm no expert, but a lover of beads who likes learning and have picked up a few things along the way. There are others out there who are way more knowledgable than me. One of the biggest clues in the quest for authenticity is from the vendor you purchase from. Part of the fun is tracking down reputable sellers and talking with them. Some of them bought the items directly from the factories when they were made and know firsthand. These dealers are usually full of interesting stories. Other vendors have bought from warehouses and distributors that deal with buying up and liquidating (literally) tons of beads. Ask your vendor what they know about the beads and where they come from (and take it with a grain of salt). Sometimes they know and sometimes they don't. And sometimes folks will say that it's something that it's not to increase the perceived value by increasing the age. There are a lot of reproductions out there these days and fakes can be deceptively convincing. Look at the packaging. Sometimes when I find vintage beads, the packaging is not always in the best condition. In some cases, things have been sitting in a warehouse for over 50 years! A lot of dirt and dust can accumulate, and sometimes things disintegrate and fall apart. If everything is pristine, ask if the boxes have been cleaned or replaced. For instance, if someone is trying to sell you antique Victorian beads in their original packaging that didn't go into distribution... chances are, they won't be in vacuum-sealed plastic. Not unless that particular Victorian manufacturer had access to a time machine. Things will be wrapped in paper or fabric. I have even found things that were packed in sawdust. Also look for identifying maker's marks or origins. This is extremely helpful in narrowing down when something has made. It might be tempting to peel off those paper labels, but they tell a lot. For instance, this hank of yellow plastic beads could have been made last week. The fact that the original paper tag remains is highly educational. From a time perspective, it says that they were made before 1989, when the Berlin Wall fell. It also indicates condition. Even if something is old, doesn't necessarily make it valuable. If the condition isn't good, it could mean that finishes can flake off, disintegrate, rub off, or with certain types of plastic... weep. An authentic tag in good condition is highly suggestive that the beads were stored in optimal conditions and the chances of them having problems is lower. So what do you do if you don't have a helpful tag or the original packaging? It gets trickier, but it is possible. With beads in vintage jewelry pieces, sometimes depending on the signature design of the piece, an origin can be deciphered. Also, look at what the beads are made of. Some materials were only used at certain times... a lot to do with what was popular and in vogue and what materials were available at the time. Take for example Victorian Mourning Jewelry; with the English Queen Victoria in mourning over her Albert, a lot of the symbolic, carved jet components became extremely stylish and highly desirable. Sometimes the shape or coloring give clues to when it was made as well. Just as the materials give hints, so do the way that the beads look. The beads were designed to be used in contemporary pieces, and therefore reflect that time period. It's a lot of fun finding out the stories behind the beads and tracking down their provenance. Using them add so much to designs – they give history and deep roots to any piece. When I think of history, I'm often drawn to the misfits and outcasts... particularly ones that despite their circumstance or situation, achieved what they set out to do. In my mind, these characters of history always seemed so much more powerful and elegant than ones handed their positions. I wanted to pay tribute to their stately marks on history. To honor these historical figures who influenced me, I created a blend of claret reds, royal blues, and silvery grays. I really love how this blend turned out. I call it the "Regent Mix". It's decadently rich and positively luscious. I threw out the budget, sprinkling in Swarovski crystals and high-end gemstones, but I felt it suited the tone of the mix. CLICK HERE to check out this new mix and CLICK HERE to see all of the different selections. What are some of the historical figures that inspired you? I've been on a roll creating these luscious Premium Mixes. So far, I've stuck to a pretty monochromatic color palette. I thought that I would do something a little differently today. I branched out and created multi-colored mixes! The first of the mixes I made was the Peacock Feather Mix. I used to keep one in my studio. I would nervously fiddle with it when I was in need of a spark of creativity. The next mix that I made was the Watermelon Mix. It's based on a slice of watermelon tourmaline and its namesake. We grew watermelons in the garden this summer. The sticky-sweet flesh of the watermelon, cooled in the refrigerator was refreshing and bright... hopefully like this mix! CLICK HERE to learn more about the different Premium Mixes, including today's two new one! One of the things that I love best about creating these premium mixes is how much it's like cooking. You add different ingredients with the hopes that the end result is pleasing. Sometimes, if an offending ingredient is added, it must be picked out... one bead at a time from the mix. More often than not, it comes together beautifully. I try to think of an image in my mind while I'm working on the blend, conjuring up good feelings and happy moments. Before I move on to less monochromatic territory, I wanted to delve in and explore more of the basic color wheel participants. One of the colors that I haven't done yet was green. I had made a "Lucky Mix" a few months prior that was inspired by shamrocks and leprechauns, but for this.... I wanted to do something different. Thusly, I created the "Enchanted Glade Mix". It's actually one of my favorite memories from New York, oddly enough. You wouldn't think that there's a glade there, let alone an enchanted one. But I remember going to a part of Central Park that I had never been to before. I was with a friend who followed, but not without complaint. We plowed through a rather stickery patch when all of a sudden, a clearing opened up before us. It was still. It was beautiful... the kind of beautiful that shuts you up and makes you actually regard your surroundings. It was cinematic in how breathtaking the moment was. I wanted to capture that and I'm fairly confident that I did. This was the inspiration for the next mix... "Kitty Nose Pink". I remember some days where it was cold and depressing out and a funk had securely settled itself upon me. The only remedy was that of a cat. They know exactly when they're needed and avail themselves of the moment, fully and completely. The thing about a kitty nose is that it's not one color. It changes depending on the temperature or their mood. I must, at this time, make a disclaimer. Not all cat noses are pink and the pinkness of their noses does not necessarily make them more personable than cats with other colored noses. In fact, Babette (who has a little licorice nose), is quite pleasant and has many favorable human attributes. This is the mix that I created based on that little triangle of flesh. As an added bonus, a portion of the money made on the "Kitty Nose Pink Mix" will go towards a Breast Cancer Awareness charity. You can take a look at the blends that I've put together by CLICKING HERE. You can also go directly to the "Enchanted Glade Mix" by CLICKING HERE and going to the "Kitty Nose Pink Mix" by CLICKING HERE. Until we finish the renovations on the Annex, this is what our living room floor looks like. Believe it or not, I spent the morning tidying it up before I took this picture. Even for me, an appreciator of organized disorganization, it'll be nice once it's all cleaned up and the living room is presentable again. (I can't imagine what William thinks when he comes home to this. All I know is that on his tombstone, it'll probably read, "Here lies long-suffering, William. He was good and patient.") As a side note, I am perfecting a sort of hopscotch ballet navigating the clutter and I think that might be good for my glutes and calves. When I'm not at home, I throw a blanket over the majority of it. Otherwise the cats tend to steal things. Those trixie kittens! The living room floor is not the only space that has been corrupted. This is one of the kitchen counters. If you can see it in your mind, imagine only a bowl of fruit and a ceramic tray where we deposit our keys and empty our pockets. I know... hard to envision, but that's its normal state. 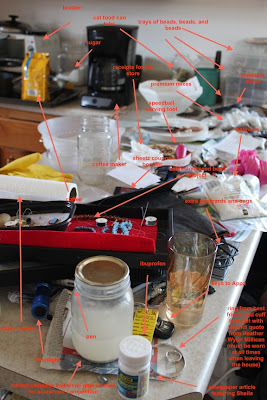 I won't even go into photographing my makeshift work desk or our dining room table. Those surfaces have succumbed to the hoard as well. They too have been assimilated. Once the Annex is finally open, 99% of the clutter will go away. I might keep a tray or two around for at-home projects, but the majority of the work-related materials will be tucked away a few miles down the road. I'm picturing neat metal shelving units and expanses of work tables. I'm dreaming of organized trays and felt-lined cookie sheets with minimal clutter and projects well on their way, checked off to-do lists, calendars flipped open to the right months, and tidy clear plastic boxes of my beads and crafting supplies. The Annex will be a good thing, indeed! With all this talk of the oncoming bad weather on the horizon, I was inspired to create a "First Snow Mix". In creating this mix, I thought about the excitement of seeing the transformative power of snow and the crystalline cleanness of the first snow. Overnight the world can be turned into a winter wonderland! I tried not to think about all the scraping or shoveling or wet socks. I tried not to think about dirty slush or ashen roads. I did try to think about the cool, icy color-palette. I used a mix of whites and crystal clears with a sprinkling of grays and silvers. I even broke the budget and threw in a healthy portion of Swarovski crystals. I'm really pleased with the way this Premium Mix turned out... even if I'm not pleased that cold weather is on its way. CLICK HERE to find out more about the First Snow Mix and to get your very own. We recently picked up a line of hand-painted ceramic components at Allegory Gallery. They're all handmade in Peru and are extremely detailed. We've been friends with the person responsible for creating them for years. 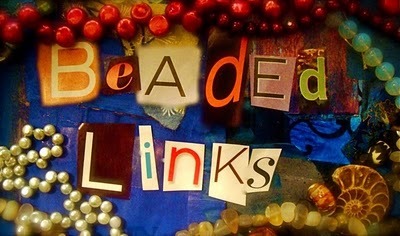 We love the beads and think they're so much fun! I shared a teaser picture on Facebook about our acquisition and one of our friends (who lives some distance from the shop) thought they were fun also and asked if we would be offering them online. We're still growing our internet presence and it'll take time to build up an online inventory that compares with what we offer in the store and have hidden away. So if there's anything in particular that you're interested in, just let us know and we'll see what we can do! For a limited time, I've marked down the prices of the Painted Ceramic Beads online. CLICK HERE to take a look at the selection; there are all kinds of cool skulls and birds.... and if you like them, pick out a couple! Want to show your support for the arts? Looking for some gifts for the holidays? Or maybe you just need a new 2013 calendar? 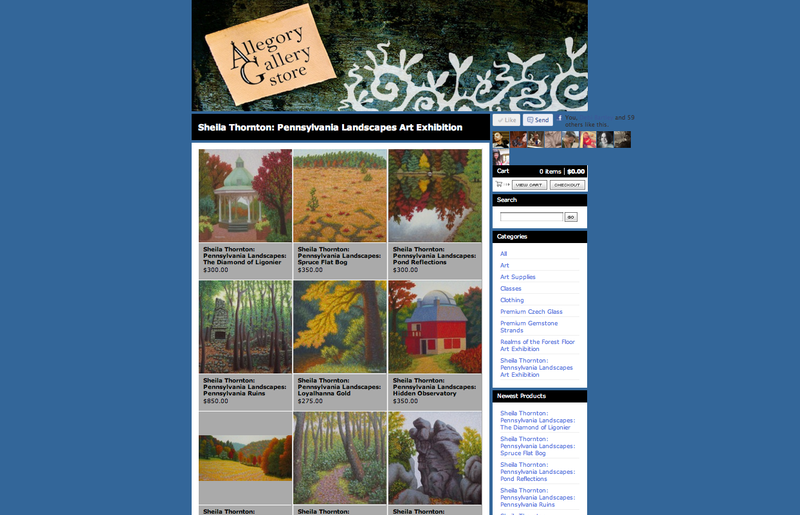 Whatever the case may be, Allegory Gallery has teamed up with artist, Sheila Thornton, to create a beautiful calendar showcasing pieces from her latest exhibition, "Sheila Thornton: Pennsylvania Landscapes". Pre-order your calendar today! CLICK HERE! For a limited time, they'll be discounted at the reasonable price of $10! We're doing a pre-sale to help offset the printing expenses. This is a wonderful way to enjoy the natural beauty of Southwestern Pennsylvania! 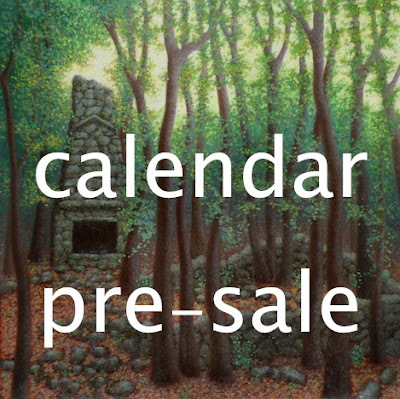 As an added bonus, the calendar will include three NEVER BEFORE SEEN paintings! CLICK HERE to find out more about the calendars and to pre-order your calendar today! And... if you would be so kind of pass this along to anyone you know who might be interested, that'd be wonderful! We'd be most appreciative for your support and for your kindness in making this project a success! So maybe I've been watching a little too much Spartacus, because I couldn't shake the idea of creating a gladiator-inspired mix. The ingredients are rich and exude warmth. I really went all out on finding just the right materials for this particular mix. To find out more and to get your own, CLICK HERE. When I'm at the shop, it's hard not to pull everything off the walls and create beautiful combinations and mixtures of colors and textures. I decided not to resist this impulse and create a few choice mixes! In creating each of the different mixes, I considered a lot of different things. One of the biggest was creating something that was evocative of a sense memory. Whether it's the crisp feeling of the air while enjoying the season, like with the Autumn Mix, or standing outside looking for shooting stars like the Midnight Mix, each of them has a story. I figure that I'll make small batches to reflect those thoughts and emotions, and then pass the mixes along to you! To find out more about the mixes and to get your very own, CLICK HERE. When I used to make design challenge kits, these types of mixes would sell out almost immediately and people requested them nonstop. So I've brought back the luscious mixes and hope you enjoy them as much as I do! I was inspired to whip out the griddle this morning by a status update by Jennifer VanBenschoten on Facebook. She mentioned how much her son loved pancakes and how excited he was for breakfast. I thought to myself, "Me too! I love pancakes too!" So I rummaged in the cupboards and found a taro pancake mix that Candice sent me from Hawaii and made a plate of them. Delicious! The taro is subtle and adds an earthy sweetness to the pancakes which were mighty fluffy and the perfect vehicle to sop up the B Grade maple syrup we picked up from Sweely Lane Sweets during Fort Days this past weekend. Now I'm ready to conquer my day! Tucson-based artist and musician, Daniel Martin Diaz, has a new project in the works and you can help him make it happen! 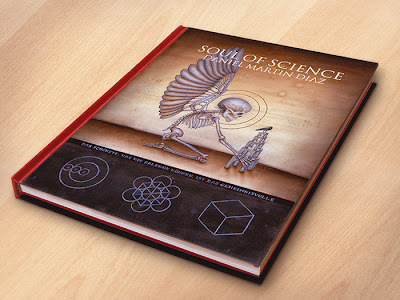 He wants to create a book, featuring the hauntingly beautiful images of his original works of art called, "Soul of Science". In order for him to realize his vision, he needs our help! He's started a Kickstarter campaign to fund this endeavor. You can find out more about it by CLICKING HERE. But don't delay, the deadline for pledges is November 30th! When the weather starts getting nippy, I bring out the big pot! I make soups and stews as a way to combat the coming cold. Last night, I made an overflowing pot of Cincinnati Chili. I picked up a starter pack from G Squared across the street, but I have to admit that I modified the recipe. (I can't think of a time when I didn't tweak a recipe at least a little bit.) I sauteed onions and garlic to flavor the beef and also added sweet sausage. Since I was tripling the portion sizes, I tossed in a blend of additional pinto, kidney, and black beans. I also included Scharffen Berger bittersweet dark chocolate. Before serving, I put in some bacon and a second "dump" of spices. One thing I've learned from watching Food Network chili cook-off competitions is that they use multiple spice "dumps" at different stages in cooking. Tonight, I'm going to make up some spaghetti and serve the chili over it the way they do out in Cincinnati. October's featured author for Words in Process is Ted Carns. Please come by and hear Ted read from his book and talk about the process behind, "Off On Our Own". 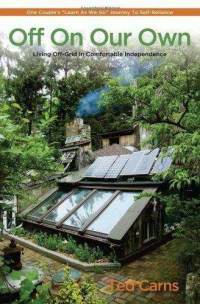 His book details his voyage towards self-reliance, living off-the-grid with zero-waste. Our monthly reading series, Words in Process with Amy Yanity, takes place THIS Thursday, October 18th from 7PM to 9PM at Allegory Gallery. Books will be available at Second Chapter Books; have Ted sign your very own copy! After Ted reads, the floor will be opened to the audience to share some of their work and what went into the writing. AND as a special incentive to come by, Keith Campbell will be raffling off a dozen of his delicious cupcakes! Allegory Gallery is located at 139 East Main Street, Ligonier, PA. In recent conversations, a perusal of blog entries, and a general ear to the rail of the creative community... it's apparent that "something" is in the air. It's hard to put a definitive shape and form to this feeling out there... but it's definitely there. It's kind of like sensing that someone else is in the room without having to look or rely on any of the other of the major senses. I think it's more than just a seasonal shift, but it feels like there's an increase in general unease, restlessness, insecurity, boredom, and prickly despair. I can almost hear someone in the background saying, "le sigh". I've only just picked up on this myself. I've been so busy with my own projects that I haven't really realized it until now. Looking up from my work, I've noticed there's a proverbial and subtle change in atmospheric lighting... a little grayer and a little less substantial. In the blogosphere, I have seen a growing number of die-hard bloggers slacken the frequency of their posts or lighten the emotional depth of their entries. (Myself included.) I've also become aware of the lackluster responses to the content that is generated. Recently, a very prominent blogger mentioned that she was blue... in yesteryear, her post would have received hundreds of comments... nowadays... maybe ten. Did people just get used to her sadness? Did they stop caring? Did they stop reading? Who knows? And maybe it's just me... or has there been an increase in activity on social networking sites like, Facebook? I see more and more people turning to sound-bite sized status updates as opposed to longer entries. With my own blog, I've noticed a drastic reduction of unique visitors and a higher percentage of the people that do read the blog using the Networked Blogs feed in my Facebook stream. I try to avoid statistics, but every once in awhile, I get curious to see the numbers and how people are using the blog. I've been blogging long enough to know that there are seasonal dips in readership, usually corresponding to major holidays or around the school year or work day... but it seems like, from what I can tell... something "more". And it's not just me. Others have sort of noticed it too. One of the other things there's been a lot of is fighting and bickering... and not just online either. Is it because it's an election year? I don't know. In the past, I might have said that it was because of the recession... but numbers are up and it seems like people are doing better financially. But there's still something there, like a trace musty smell. With the general funk in the air, there's also been a reaction to it with one-minute meditations, "uplifting" chain letters, inspiring pictures with quotes, and people trying to do "something" about the "something" that's there, in the air. Is this blog post another "something" about "something"? I don't know. I walked through the woods with no mission in mind. My camera was slung around my neck, but it was more out of habit than any real intention. As I made my way around the property, lost in my thoughts, I suddenly looked up. And there before me was a family of deer. They looked at me blankly, just as startled to see me as I was to see them. Seeing deer here is not unusual, but generally they're at a distance and not so close. Their white tails are usually up, signaling danger and retreat. I snapped my picture and went about my way. They continued to eat. When I looked back over my shoulder closer to the house, they had all but disappeared into the fall foliage. They had melted into the scenery, moving stealthily. I kind of feel like that now. I'm quietly working in the background on many projects, both personal and professional. Besides promoting a few events, I've kept a rather low profile. It's that time of year. I feel like I am gathering my forces... soaking in energy... and preparing myself for things to come. There's something primal in this... tied with the cycles of nature. I can't really say yet what things are in the works, but I'm sure that I'll share them in short order as soon as I get the word. Some of the things are big... others are small, but just as important and perhaps even more significant. 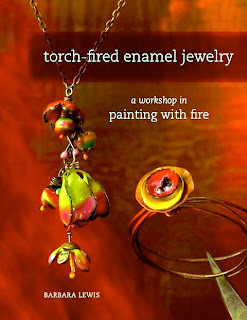 I recently became aware of a "book review" left for Barbara Lewis' book, Torch-Fired Enamel Jewelry: A Workshop in Painting with Fire. I am reluctant to call it a "book review" because it seems more like the disgruntled venting of someone deeply insecure. What is it with people who use the internet as their playground of negativity? They can only throw stones instead of building something with them. Here's what I think about the book... it's a beautiful, intelligent, and inspiring resource. I constantly refer to it and recommend it highly. And here's what I think about the author.... Barbara is a patient, thorough, and generous teacher who goes above and beyond to make sure that her students understand the concepts and can utilize them in a practical way. She is honest, sincere, and truly a good person. She has been nothing but supportive of those in her community and her craft. Without hesitation, I can fully endorse her and her technique. Shine on, Barbara! If you can't make it to Ligonier, you can still take part in the fun! CLICK HERE to see the show of nine original oil paintings by Sheila Thornton online. You can also take one home if you like! The paintings will ship out at the end of the month at the close of the exhibition. If you're in the area, the show will remain up until November 1st! Stop by and see the beautiful Impressionist-style plein air paintings! 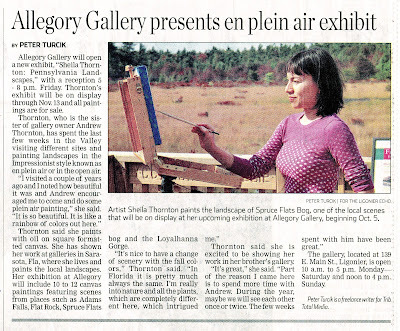 Make sure to check out this recent interview with artist, Sheila Thornton, in the new issue of the Ligonier Echo. Click on the image for a larger view. 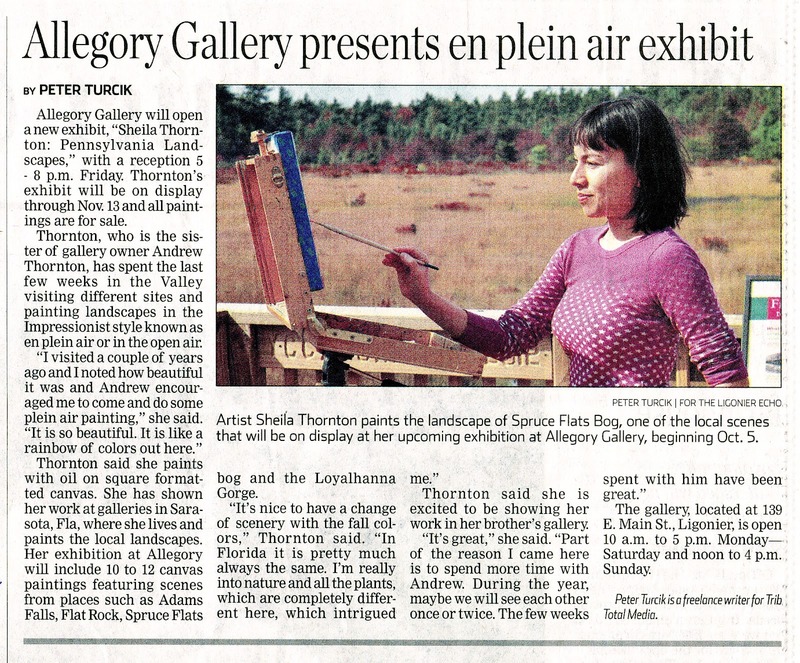 The article discusses her upcoming show at Allegory Gallery, "Sheila Thornton: Pennsylvania Landscapes" and her exploration of the region, as well her thoughts about spending time with family. It's a great article! If you're in the area, you should definitely drop by! The show runs from October 5th to November 1st with an opening reception THIS FRIDAY, October 5th from 5PM to 8PM! Meet the artist and see the lush landscapes of the region captured in paint! Come celebrate the autumnal beauty of the region! Allegory Gallery is pleased to present the latest exhibition of Impressionist-style, plein air artist, Sheila Thornton. The show, "Sheila Thornton: Pennsylvania Landscapes" will feature new oil paintings done on-site in Southwestern Pennsylvania. The show will run from October 5th to November 1st, with an opening reception on Friday, October 5th from 5PM to 8PM. Meet the artist and see the lush landscapes of the area captured in paint! Need a bead or finding at midnight? You might find what you need in a pinch at a 24 hour superstore!